One of the main concerns for anyone looking to strap a fitness-tracking Apple Watch to their wrist is how accurate the device is at measuring your health, and Apple has tackled the problem head on. The company's engineers, managers, developers and other employees have been working for a year in a high-tech Apple gym to help ensure the Apple Watch gets every point right, reports ABC News. 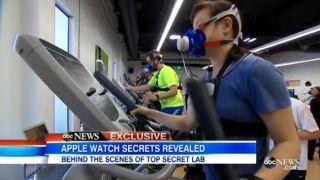 The employees have been doing yoga, rowing, running, lifting, stair-climbing and more, and hanging out in various "climate chambers," all with the Apple Watch - or a version of it, at least - attached and monitoring. And for a lot of this they didn't even know what they were testing, since the Watch was obscured to maintain secrecy. Given how secretive Apple usually is, it's surprising that they let a news outlet into the facility - but maybe it's a sign of how badly they want to convey the amount of work that went into the Apple Watch's fitness components. Neither Google nor any of its partners have been forthright in how they've tested their own wearables, and perhaps it will show when the Watch finally launches in April. All that work and research is certainly reflected in the Apple Watch's price, at least.